The trimming of foals in the first few months of life is crucial to the longevity and useful life of the horse. It is advisable to make the first trimming in the 20 or 25 days of life, under normal conditions; if the foal is born with any deviation in some of its legs, you should start trimming earlier and continue doing the cut out periodically. 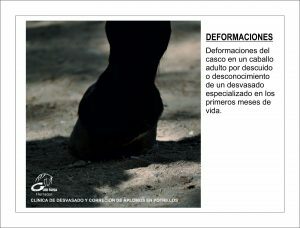 It is very important that the first trimming must be performed in the time mentioned, because in foals the hoof growth is much faster than in adult animals. For the foals that are born with problems of limbs, it is advisable to take x-rays to see if the deviation that can be corrected with trimming. In these cases the rasping or trim, as appropriate, should be carried out every 8 or 10 days until the correct angles are achieved; or it could be necessary to put a horseshoe. 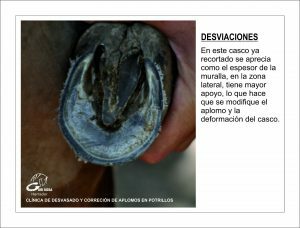 At this age you can’t use nails, but there are on the market shoes that are attached with a special glue, which come with medium length, lateral flow or clip, use the appropriate after a study to awareness of the farrier. 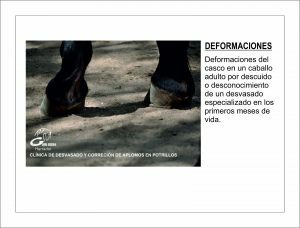 Technically, trimming foals in the first few months of life is important, since in this period they have growth plates (cartilage) where you can correct the limbs without damaging the structure. In children, parents take them to the orthopedist between 3 or 4 years to correct any deviation in their legs or feet. We can make a comparison in foals, but the period to make corrections is between 20 days to 9 months. This is important to note – the earlier the better chance for correction. 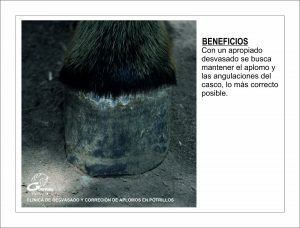 It is also important that the farrier or the person who performs the work is trained for that purpose and they use the correct technique. Breeders of sport horses are very aware of the benefit that trimming foals brings in their breeding farms. For that reason many farriers are part of the regular staff of these establishments. 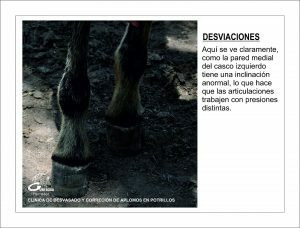 Because of the mechanical movements of the Peruvian Paso Horse the hooves of the front legs usually develop a deviation from correct angles. 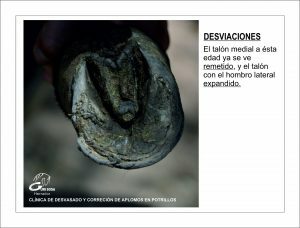 What is quite common in a large percentage of Peruvian horses, the medial part of the hoof is atrophied and expands into the side.  The reverse process is usually present in the hindquarters. 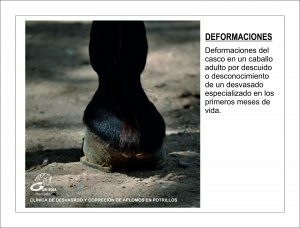 This deviation once it is present in an adult horse, if only the hoof is involved, is corrected with a corrective shoeing, which must be performed every 35 or 40 days, depending on the growth, and for a year and a half. 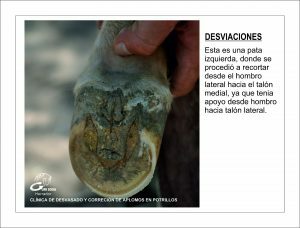 If you are aware of the importance of the trimming at an early age you will not have the issues with hooves that can be seen in adult animals. In parallel with the trimming of foals, breeders have another benefit of early trimming in proper training of their foals, which is so important in the life of the animal and the handlers. This early training is a great benefit for a later date when halter and riding training start. 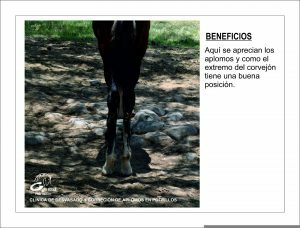 In the breeding of horses where things are done with seriousness and consciousness, look at the trimming of foals as an investment, not an expense.